You deserve to feel great about pregancy, birth, and parenting! You deserve to feel great about pregnancy, birth, & parenting! The childbearing year is so exciting, but it can be a little overwhelming sometimes. Right now you might be feeling like there's a lot of information to absorb about best practices for pregnancy and birth. All it takes is one simple web search to fall down the rabbit hole of pregnancy dos and don'ts, scary birth stories and parenting "gurus" giving you advice you didn't ask for. Everyone has an opinion about what you should be doing, and most of the time it's completely different than what everyone else said! So, when there's no "right" way to do things, and you're feeling stressed out before the baby is even here, what's a new parent supposed to do? Assemble your team, get educated, and trust your gut. My name is Vanessa, and I believe in you! 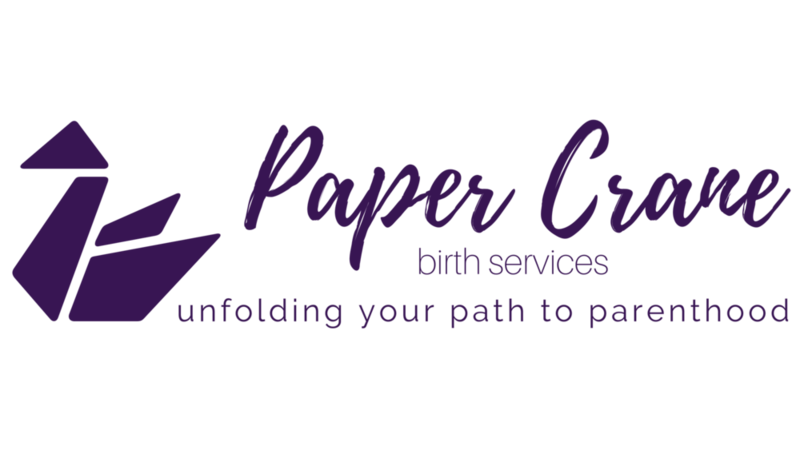 I started Paper Crane Birth Services because I am committed to the elimination of self-doubt in birthing families. I pride myself in facilitating a safe space for my clients to ask questions and learn about their options during the childbearing year and beyond. I combine my empathetic nature with my skill for organization and research to create a calm, stable environment for pregnancy, birth, and postpartum. My ultimate goal is for my clients to feel prepared, supported, and confident on their path to parenthood! I achieve this goal in three ways: engaging childbirth education, birth support according to your individual needs and preferences, and hands-on, encouraging postpartum care. What’s with the paper crane? When you're doing origami, every fold you make in the paper, even the imperfect ones, helps form delicate, beautiful piece of art. This is just like life - every experience, event, milestone, and memory helps shape you into who you are. I think of pregnancy and birth as one of the many “folds” that helps turn us into who we are - it certainly is one of the most transformative life experiences a human can have! It's a privilege to be a witness to these transformations and carry these memories with me. Please read more about the services I offer below. I want to help you figure out your goals for pregnancy and birth and give you the support you need to achieve them. If you're ready to work together, or you'd like to learn more about me or my services, let's schedule your free consultation! Check out my childbirth education class offerings! Upbeat, custom classes designed to fit your needs. Curious about what a labor doula does? Click below! Physical, emotional, and informational throughout pregnancy, labor, and birth. Hands-on care for the whole family.